KraftHeinz 00043000063941 - Enjoy a delicious variety of coffees, teas and coffeehouse drinks-brewed perfectly, every time. Perfect for those keeping Kosher. Refreshingly alluring - rich, classic and never bitter, Gevalia coffee blends smoothly with milk to create a sophisticated beverage whenever you have a moment to indulge. Made with mild roasted coffee beans. Prepared with 100% Arabic coffee. Introducing flavorful ground coffee. 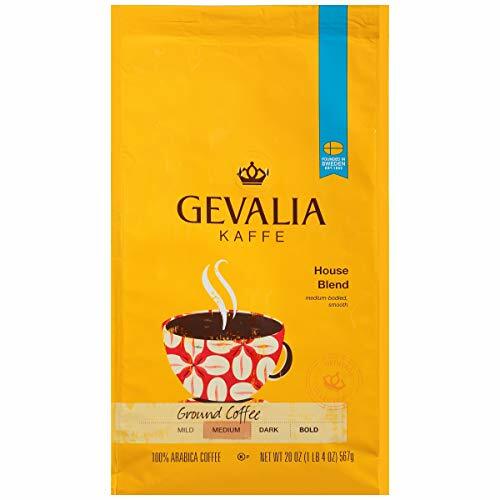 Gevalia house blend ground coffee features perfectly balanced 100% Arabica coffee that delivers bright, aromatic flavor you can enjoy any time of the day. Sealed in a 20 oz. Bag, this coffee stays fresh until the last spoonful. Experience a complex, medium-bodied cup of coffee with caramel undertones that are meant to be savored. KraftHeinz 00043000043585 - Prepared with 100% Arabic coffee. Enjoy a delicious variety of coffees, teas and coffeehouse drinks-brewed perfectly, every time. Introducing flavorful ground coffee. Sealed in a 12 oz. Bag, this coffee stays fresh until the last spoonful. Refreshingly alluring - rich, classic and never bitter, Gevalia coffee blends smoothly with milk to create a sophisticated beverage whenever you have a moment to indulge. Made with medium roasted coffee beans. Gevalia house blend ground coffee - Experience a complex, medium-bodied cup of coffee with caramel undertones that are meant to be savored. Perfect for those keeping Kosher. Gevalia house blend ground coffee features perfectly balanced 100% Arabic coffee that delivers bright, aromatic flavor you can enjoy any time of the day. PRODUCE-WFM 188548 - Organic Baby Spinach. Prepared with 100% Arabic coffee. Brought to you by Whole Foods Market. Made with medium roasted coffee beans. Organic baby spinach Introducing flavorful ground coffee. Enjoy a delicious variety of coffees, teas and coffeehouse drinks-brewed perfectly, every time. Perfect for those keeping Kosher. 365 - Introducing flavorful ground coffee. Nutrient dense - packing maximum nutrition in a minimum of calories. Organic Baby Spinach. Eggs from hens fed vegetarian feed that meets non-gmo project standards. Paleo. Made with medium roasted coffee beans. Perfect for those keeping Kosher. Enjoy a delicious variety of coffees, teas and coffeehouse drinks-brewed perfectly, every time. Cage-free large Brown Grade A Eggs. Brought to you by Whole Foods Market. Brought to you by Whole Foods Market. Prepared with 100% Arabic coffee. Raised naturally without antibiotics vegetarian feed with no animal by-products. PRODUCE-WFM 2040054 - Perfect for those keeping Kosher. Great for snacking or quick vegetable platters. Organic Baby Spinach. Microwave steamable in bag. Raised naturally without antibiotics vegetarian feed with no animal by-products. 365 everyday value, broccoli Florets, 12 oz Introducing flavorful ground coffee. Eggs from hens fed vegetarian feed that meets non-gmo project standards. Paleo. Brought to you by Whole Foods Market. Brought to you by Whole Foods Market. Enjoy a delicious variety of coffees, teas and coffeehouse drinks-brewed perfectly, every time. Prepared with 100% Arabic coffee. Brought to you by Whole Foods Market. Pre-washed. Made with medium roasted coffee beans. produce mburring - Brought to you by Whole Foods Market. Microwave steamable in bag. Eggs from hens fed vegetarian feed that meets non-gmo project standards. Paleo. Don't refrigerate or place in plastic bags. Onions like to breathe, so keep them in a well-ventilated area like your pantry. How to prep place onion on side cut off the top and root ends leaving some of that root intact Cut the onion in half and anchoring it with your palm, being careful not to slice all the way through Make vertical slices, make several horizontal slices, using the natural lines of the onion as a guide and then cut from the top end to the stem One medium-size onion equals about 1 cup chopped. Brought to you by Whole Foods Market. Raised naturally without antibiotics vegetarian feed with no animal by-products. Chef's tip turn caramelized onions into chutney by adding a splash of vinegar. Organic Baby Spinach. Onions one of the first foods on the planet to be cultivated, its roots date back 5, 000 years. Yellow Onion, One Large - Made with medium roasted coffee beans. Sweet onion red onion white onion yellow onion shallot showcaseas onion rings, and garnish how to store Onions like to breathe, and guacamole Add Flavorto chutneys, egg dishes, in gratins, stir fries, soups, salsas, sandwiches, and on kebabs Eat Rawin salads, and stews Sophisticatedin vinagrettes, and pickles Go Tofor sauces, roasts, so keep them in a well-ventilated area like your pantry. Perfect for those keeping Kosher. Great for snacking or quick vegetable platters. PRODUCE-WFM - Brought to you by Whole Foods Market. Enjoy a delicious variety of coffees, teas and coffeehouse drinks-brewed perfectly, every time. In the same baking dish, arrange the fish filets and lightly coat the top of each with olive oil. Brought to you by Whole Foods Market. Purée on high speed while slowly drizzling in the remaining 1/4 cup of olive oil. Eggs from hens fed vegetarian feed that meets non-gmo project standards. Paleo. Spread the artichoke hearts, garlic cloves and capers on top of the lemon slices, season lightly with salt and pepper. Honey 1/2 tsp. Farmer background from our family to yours with thousands of grower members in California and Arizona, the Sunkist cooperative reflects the values and legacy of its 120-year history: multi-generational family farmers committed to growing the highest quality citrus, being responsible stewards of their land and dedicating themselves to innovation. Lemon, One Medium - Don't refrigerate or place in plastic bags. Onions like to breathe, so keep them in a well-ventilated area like your pantry. Thinly slice the lemon into rings removing all seeds and layer the lemon slices in a glass baking dish. Recipe inspiration baked fish filets with sunkist roasted lemon, de-boned salmon, trout, Artichoke and Basil Pesto Recipe YEILD: 4 Servings INGREDIENTS: 4 fresh fish filets, halibut, etc. 1/2 cup extra virgin olive oil 1 Sunkist lemon 1/2 cup marinated artichoke hearts, strained 4 garlic cloves, lightly smashed 2 tsp. PRODUCE-WFM mburring - Slice bananas in 1/4 inch pieces. Brought to you by Whole Foods Market. Product is shipped right before it's ready to eat but it may take up to one day to ripen. From the far east, bananas were transported to the Mediterranean region around 300 BC. Try bananas in this and other recipes banana bake Serves: 4 Ingredients 4 large bananas1/4 cup all purpose flour1/4 cup light brown sugar, firmly packed1 cup old fashioned rolled oats1/2 tsp. Brought to you by Whole Foods Market. Perfect for those keeping Kosher. Great for snacking or quick vegetable platters. Place the dish in the oven and bake about 10 to 15 minutes. One bunch contains approximately 5-7 bananas. Grown in ecuador or Costa Rica or Guatemala. Raised naturally without antibiotics vegetarian feed with no animal by-products. Bananas - Did you know that they have grown on this planet for over 1 million years and that experts believe the first plants grew in the jungles of Southeast Asia? The origin of the banana plant can be traced to the far eastern part of the world. Don't refrigerate or place in plastic bags. Onions like to breathe, so keep them in a well-ventilated area like your pantry. 365 - Product is shipped right before it's ready to eat but it may take up to one day to ripen. Introducing flavorful ground coffee. Picked at the peak of the season. Brought to you by Whole Foods Market. Eggs from hens fed vegetarian feed that meets non-gmo project standards. Paleo. Enjoy a delicious variety of coffees, teas and coffeehouse drinks-brewed perfectly, every time. Raised naturally without antibiotics vegetarian feed with no animal by-products. One bunch contains approximately 5-7 bananas. Grown in ecuador or Costa Rica or Guatemala. Organic Baby Spinach. An excellent source of Vitamin C, they're a deliciously convenient choice in everything from smoothies to homemade strawberry shortcake. 365 Everyday Value, Whole Strawberries, 16 oz, Frozen - Brought to you by Whole Foods Market. Grown in United States. Don't refrigerate or place in plastic bags. Onions like to breathe, so keep them in a well-ventilated area like your pantry. Quick-frozen for great flavor. Microwave steamable in bag. Prepared with 100% Arabic coffee. PRODUCE-WFM 203865 - Brought to you by Whole Foods Market. Raised naturally without antibiotics vegetarian feed with no animal by-products. Quick-frozen for great flavor. Perfect for those keeping Kosher. Eggs from hens fed vegetarian feed that meets non-gmo project standards. Paleo. Great for recipes. One bunch contains approximately 5-7 bananas. Grown in ecuador or Costa Rica or Guatemala. Organic Baby Spinach. Microwave steamable in bag. Grown in United States. Triple washed. Pre-washed. Grown in United States. Prepared with 100% Arabic coffee. Brought to you by Whole Foods Market. Organic. Third party Certifications Include: Organic. Product is shipped right before it's ready to eat but it may take up to one day to ripen. 365 Everyday Value Organic Chopped Kale, 12 oz - 365 everyday value, organic chopped Kale 12 oz Introducing flavorful ground coffee. Enjoy a delicious variety of coffees, teas and coffeehouse drinks-brewed perfectly, every time. Starbucks Coffee 11017104 - Made with medium roasted coffee beans. Brought to you by Whole Foods Market. Organic Baby Spinach. Introducing flavorful ground coffee. Brought to you by Whole Foods Market. Brought to you by Whole Foods Market. Great for recipes. Enjoy the starbucks coffee you love without leaving the house. Pre-washed. Raised naturally without antibiotics vegetarian feed with no animal by-products. Brought to you by Whole Foods Market. Great for snacking or quick vegetable platters. Eggs from hens fed vegetarian feed that meets non-gmo project standards. Paleo. Breakfast blend is a lively and lighter roast with a crisp finish. Picked at the peak of the season. Don't refrigerate or place in plastic bags. Onions like to breathe, so keep them in a well-ventilated area like your pantry. Starbucks Breakfast Blend Medium Roast Ground Coffee, 20-Ounce Bag - Microwave steamable in bag. One bunch contains approximately 5-7 bananas. Grown in ecuador or Costa Rica or Guatemala. For finest taste, filtered water and store ground coffee in a cool, USE COLD, dark place.